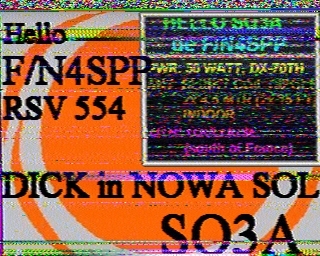 Slow Scan Television (SSTV) is a ham radio operating mode in which pictures are transmitted over radio, via tones of 1500-2300 Hz with synchronization pulses at 1200 Hz. I.e., it uses the same bandwidth as voice communications, rather than video bandwidth (several MHz). This bandwidth limitation implies that the scan rate is much lower than full-motion video: a single still image in roughly one minute, rather than some 30 frames per second. 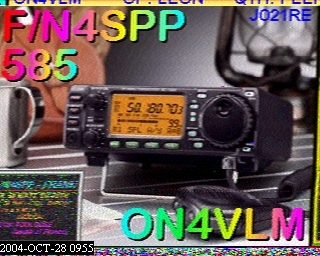 The 3 kHz bandwidth can be accommodated by standard SSB and FM transceivers (and phone lines). 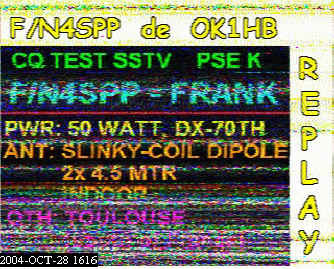 In the original SSTV days (late 1950s, early 1960s), special SSTV monitors used surplus P7-phospor radar picture tubes with roughly 8 sec after-glow retention of the image. In those days, transmission of each (monochrome) image frame of 120 lines took 8 sec, or 1/15 sec per scan line. 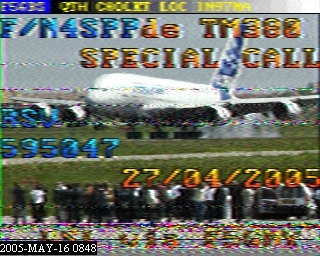 Images were captured with a vidicon tube or a modified video camera for "live" images, and fly-spot scanners for printed images. Extensive equipment was required. In the 1970s, digital circuitry and solid state cameras simplified the process. Today, standard image resolution is 320x240 (240 lines of 320 pixels) in 16-bit color, or even 640x480 in 24-bit color. 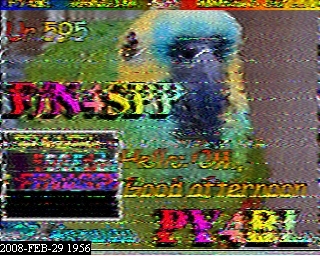 As the audio bandwidth has not been increased, the image transmission time has increased to 1-2 minutes. 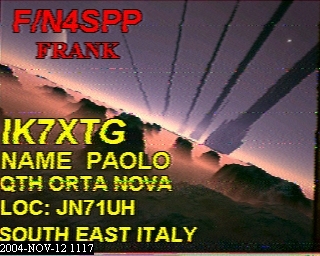 Image transmission and reception is now simply done on PCs that interface with the transceiver via the soundcard and very simple & cheap interface circuitry. 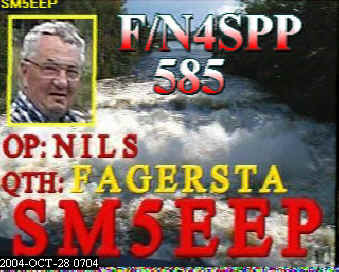 Excellent freeware is available. You can be on the air with SSTV in less than an hour. Over the years, several "families" of transmission modes have emerged, each with different characteristics. Each family also has a number of sub-modes, typ. 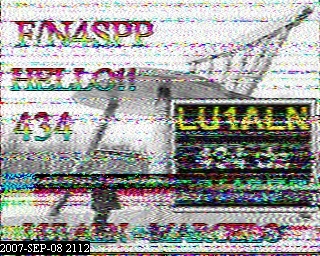 differing in the number of scan lines (e.g., 120 or 240) and transmission time (longer translates to higher image quality potential). The modes Scottie-1, Scottie-2, Martin-1, and Martin-2 are the most popular (to some extent depending on the part of the world that the operator is in). Today's PC software supports transmission and reception of practically all sub-modes. 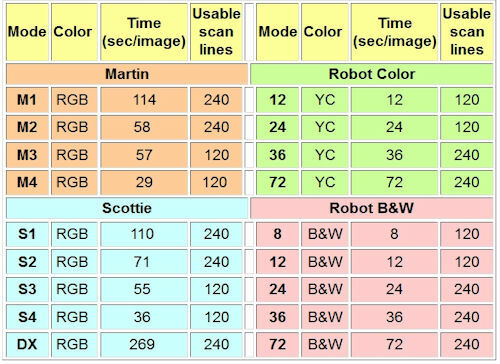 Some examples are listed in the table below (B&W = black & white; RGB = Red-Green-Blue, YC = luminance/chrominance). 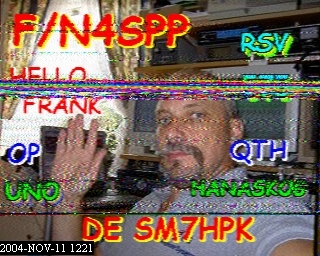 A special form of SSTV is Narrow Band Television (NBTV); the associated forum is here. 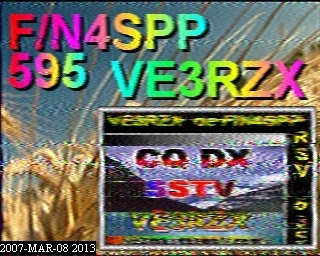 NBTV uses 32 lines that are vertically scanned, an image aspect ratio of 2:3, and an audio spectrum of 2-10 kHz. It is a direct derivative of the TV system invented by J.L. Baird in the late 1920s. 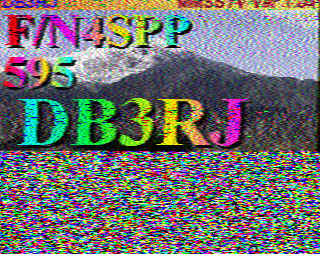 Supposedly, there is an NBTV net on Saturdays around 3.7 MHz from 08:00-08:30 local time in the UK. Here is a link to the interesting Zarkovision website about mechanical television. None of the above is to be confused with Amateur TV (ATV). It is the equivalent of commercial TV with full-size, full-motion images and sound. 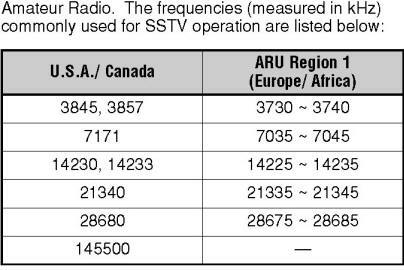 ATV is practiced on frequencies of 430 MHz and up (i.e., the 70-cm, 23, 13, and 3-cm amateur bands). For operation in the 430-440 MHz band, a standard TV tuner with UHF channels 21 and below can be used. 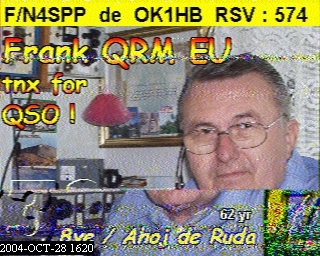 Bandwidth of image + sound is about 7 MHz (for AM image + FM sound) or 20 MHz for FM-ATV (23-cm band and above). Transmissions require a video source (camera, recorder, PC, or test image generator), a microphone, and an ATV modulator/transmitter. 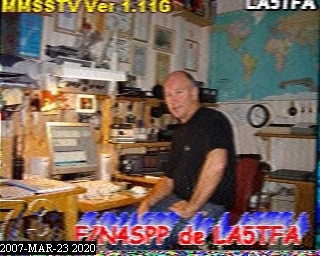 With the advent of digital terrestrial commercial TV transmissions (DVB TV), ham radio operators are also adopting digital TV and digital SSTV standards. 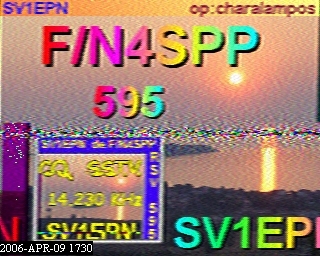 When I am active in SSTV mode, I upload the images that I receive to my SSTV Cam.